With the University of Surrey’s Summer Recruitment Fair only two weeks away, we share our 5 top tips on how to prepare and get the most out of this event. 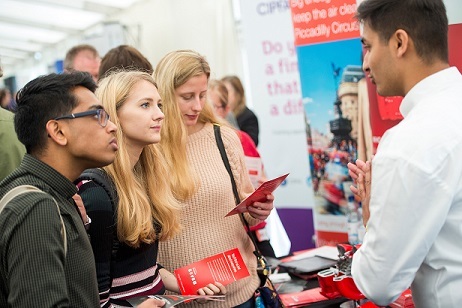 On Wednesday 9th May, we will welcome over 40 exhibitors to campus, from large graduate recruiters to smaller organisations which are actively looking to recruit Surrey students with Summer / Autumn start dates. Even if you’re still uncertain about the direction in which you want to go, it’s still a great opportunity to talk to the company representatives who may have been successful graduates themselves and can give you advice for how to navigate your own career path. It’s also a great opportunity to network and broaden your career and get a feel of what the job market is like at the moment, whatever your degree and year of study! So, how can you best prepare for the Summer Fair? Doing your research is the trick to being more confident when approaching recruiters at Careers Fairs. Look at the list of exhibitors attending the Fair beforehand. Even if your preferred employer(s) are not present, the Fair will allow you to practice talking to graduate recruiters to help to build your confidence, expand your network of useful contacts for future reference, learn industry information about your chosen sector, as well as gather information about companies, which can be invaluable during their recruitment process. The Fair only lasts a few hours, so it’s important to prioritise those companies you want to speak to and plan to visit them first. You can only get the most out of the opportunity to speak to recruiters from that organisation if you’re clear about what the organisation does and what jobs they are recruiting for. Not all organisations attending the Summer Fair will be large graduate recruiters; if you’re considering working for an SME, the Summer Recruitment Fair is the perfect place to discover upcoming job vacancies with a Summer/Autumn start date. Don’t discount an organisation because you haven’t heard of them before – take the time to look on their website and find out what business they are in. You might just discover they are the most innovative in their industry and are offering your dream job! Check out our recent blog post about the advantages of working for an SME here. 3) Prepare your killer questions! What is the company culture? This question is great as it will give you real insight into what the company values from its employees. Are continuing education and professional development important to the organisation? How much guidance would I get in planning my career? What would be a typical progression for a graduate? What would the day-to-day responsibilities be? What kind of work could I expect in my first year? What’s your advice for the application process? Megan Watkins, Analytics Consultant on the IBM graduate scheme advises to take the opportunity to ask recruiters about the application process to get real insight from placement students and graduates already at that company. You only have a few minutes to make a great first impression on a recruiter. It might seem obvious, but remember that you are in a professional setting, so match your appearance and behaviour accordingly. Whilst you’re not expected to wear your interview suit to the Fair, it’s still a good idea not to be too scruffy. We advise a smart dress code. Recruitment Fairs can seem a bit daunting, but with thorough preparation, asking thoughtful questions and listening to the recruiter’s response, you are well on your way to demonstrating enthusiasm and engagement. Smile and enjoy and we look forward to meeting you at the Fair! What do the graduate recruiters say? Nicola Morris, a University of Surrey placement student with EY says it’s really important to research all of the graduate opportunities available to you within the business so that you’re clear which area you want to go into. This will give you confidence in any later interviews or application centres when matching your skills and experience to the job role and convincing a recruiter why you are the right fit. Do you fancy yourself as the next Steve Jobs or Elon Musk? Introducing HackSurrey, USSU’s Hackathon Society.